In 2011 Trotec presented DirectMark, the first print driver using a printing function from any software for direct part marking with a galvo laser system. And now our recent release features many new fun and exciting features! Optimizing the features of our first release, managing print jobs will now be easier than ever! Job Time: In order to facilitate job time estimation and productivity the marking time is now displayed for each job! Job History: Provides a comprehensive overview of how many copies were marked, a what time, and how long each mark too. Archive: Now you can save spool files, so when additional copies are needed after completing production you can reload the directly instead of having to print them again from your graphic software. Password Protection: Never lose your optimized settings again... With a password protection your unique settings are just a click away! Added features increase the productivity and versatility of your laser! 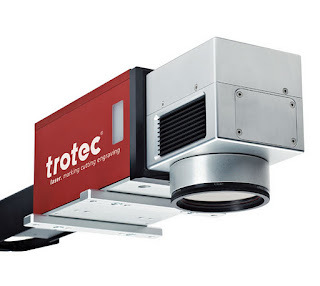 Rotary: The new DirectMark 1.2 release is compatible with Trotec's rotary unit... Allowing you to mark cylindrical parts; like rings, cups, tools, and much more! Foot Switch: Makes marking multiple jobs quick and easy, just tap the foot switch to trigger the next mark! To the operator the DirectMark driver appears as a standard properties dialogue linked to the print function and a printer queue to handle pending jobs. This was made possible by a team of software developers and laser engineers putting years of experience into Trotec's driver in order to offer features like the material database... Which makes picking the right laser parameters as easy as selecting the material of your choice from a list or the Logo Mode, which automatically vectorizes any graphic before sending it to the laser, making good use of our high speed scan heads. DirectMark print driver is standard on the ProMarker and available as an option on all SpeedMarker FL Marking Systems. What are your thoughts? How will (or have) these features help on your production line? What would you like to see on our next release? Looking to keep up-to-date with Trotec? Check out more articles, trade show information, and more under "News" on our website!